After months of evasion, the New Zealand Prime Minister has finally admitted, in response to another question from Winston Peters about UN Security Council Resolution 2334 in Parliament earlier this week, that the resolution was not put to cabinet for approval. It did not need to be, English said, because it was in line with “longstanding policy”, a refrain we have now heard repeatedly from the Government. 1) …declare that East Jerusalem (including the Temple Mount, Western Wall, Hadassah hospital, and the Hebrew University of Jerusalem) is “occupied Palestinian territory”? Resolution 2334 potentially criminalises Jews living in the ancient Jewish Quarter, rebuilt after the destruction during the years of Jordanian occupation (1948-67) and makes it illegal for Jews to pray at the Western Wall, the surviving structure of the Second Temple – Judaism’s most holy site. The resolution is in-keeping with a Palestinian strategy of using international organisations to deny any Jewish connection to the Holy Land but it is not NZ foreign policy. In fact, it is ahistorical. When asked about the anti-Israel Boycotts, Divestments, and Sanctions movement (BDS), Murray McCully said “I think the move to try and exclude Israel from business activity and the move to try and exclude Israel from engagement in international institutions and normal diplomatic activity is hugely counterproductive.” However, Resolution 2334 – specifically provision 5 – advances BDS by urging countries to “distinguish, in their relevant dealings, between the territory of the State of Israel and the territories occupied since 1967”. While sanctions on Israel may be called for by terror-sympathising academics, it is not sound government policy and is out of step with previous New Zealand policy. 3) …decide that Israel should be confined to the 1949 armistice lines? UN resolution 242, passed in the wake of the 1967 war, was specifically worded so as not to perpetuate the 1949 Armistice Lines as the final borders, in order to encourage negotiations. It is also widely acknowledged that existing settlement blocs on the outskirts of Jerusalem would stay with Israel as part of land swaps in any permanent deal. Without those, Israel would be just 15 km wide at its narrowest point, and its major cities within easy reach of missiles fired from the West Bank, a likely scenario given Israel’s experience following its unilateral withdrawal from Gaza in 2005. Resolution 2334 makes all those “swappable settlements” illegal, endorses an ethnic cleansing of Judea and Samaria, and challenges the intent of 242 – something no previous NZ government has done. 4) …stop condemning Palestinian terrorism? Shalom.Kiwi has previously reported that Murray McCully has failed to condemn Palestinian terrorism (here, here, here, and here). However, previous foreign ministers have been clear in their condemnation of Palestinian terrorism. Resolution 2334 does condemn acts of terror but is not specific, leaving the Palestinians to claim that it only applies to “State terrorism” of Israel. 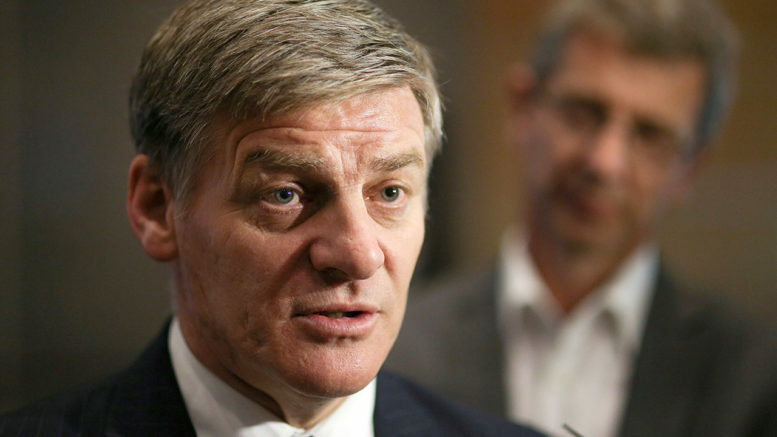 No previous New Zealand government has refrained from condemning Palestinian terrorism or calling it what it is. 5) …conclude that taking away any incentive for the Palestinians to negotiate and rewarding them for terrorism, intransigence and rejectionism would encourage them to the negotiating table? Resolution 2334 makes no specific demand of the Palestinians, perhaps because they drafted much of the text, and tells them that all the land beyond the 1949 Armistice Lines belongs to them. As mentioned above, Resolution 2334 removes the need or incentive to negotiate on settlements that could have been part of land swaps and the Palestinians have interpreted the general condemnation of violence as referring only to Israel. When resolutions like this are passed, there is no need for Palestinian leaders to change their stance of refusing to enter negotiations or their incitement to violence. Indeed, Resolution 2334 has emboldened radicals – this is surely not a NZ foreign policy. 6) …label settlements a “flagrant violation under international law” and a major obstacle to the two-state solution? Shalom.Kiwi has reported that previous statements from the New Zealand government have seldom mentioned Israeli settlements, let alone blamed them for a lack of peace. In fact, there are strong arguments for most settlements being legal. 7) …begin aligning its foreign policy with Senegal, Malaysia, and Venezuela; rather than with US, UK, and Australia? The US abstained from the vote because it was biased against Israel and they didn’t agree with the wording and the House of Representatives voted overwhelmingly for it to be “repealed or fundamentally altered”. While the UK voted for the resolution, its Prime Minister, Theresa May, spoke out against it. Australian Prime Minister Malcolm Turnbull spoke out even though Australia does not not sit on the Security Council. New Zealand has chosen to stick by the decision to co-sponsor the resolution with Senegal, Malaysia, and Venezuela, signalling a clear shift in diplomatic alliances. 8) …start taking a more anti-Israel stance than Egypt, who withdrew from sponsoring the resolution? Egypt tabled a moderated version of the Palestinian text but withdrew from taking it to a vote at the 11th hour. New Zealand and the other co-sponsors stepped in to make sure the text was voted on, choosing to follow seldom-used procedures of the UNSC. While Egypt has a peace treaty with Israel, there is anti-Israel propaganda from government, education, and media. Such anti-Israel sentiment has never been part of official NZ policy. 9) …believe that betraying the Middle East’s one true democracy, the only Middle Eastern state that shares NZ’s liberal values, is an act of friendship? New Zealand’s Permanent Representative to the United Nations, Ambassador Gerard van Bohemen, admitted that he clearly understood that the resolution was an insult to Israel. Such a betrayal of a diverse and democratic society in the Middle East is not the act of a friend. It is also not an act of friendship to state that you want a good relationship and also say that the one you betrayed should make the first move towards reconciliation. 10) …disregard the Jewish connection to, and legal rights to settle in, the West Bank, as enshrined in still valid legal instruments? By labelling the West Bank as occupied Palestinian territory, and settlements as illegal, Resolution 2334 denies Jewish historical connection and legal rights to settle in the West Bank and is inconsistent with the 1922 Mandate for Palestine and the UN Charter that adopted the Mandate, as well as the Oslo Accords. The government has never before delegitimised a Jewish presence in the Holy Land. The resolution was not in line with longstanding policy. This means that the Prime Minister’s justification for it not being put to cabinet holds no weight and it was a gross breach of procedure. If Mr English was so sure it was longstanding policy and that it did not need to be put to cabinet, why has he and his government evaded the question for months, until he had no option but to respond to a direct question in Parliament? And why was the resolution not put to cabinet by Minister McCully? Thousands of New Zealanders have expressed their concerns to the Government regarding UN Resolution 2334, in letters, newspaper advertisements, petitions, protests, articles, and in comments on social media. And it is still news, and questions are still being asked in parliament, three months after it passed. The New Zealand public deserves the truth, and it deserves better.